2000 Naiad 5.8 RIB, New Zealand-built 5.8 metre RIB offshore cuddy cabin on dual axle trailer. Powered by twin 100HP Yamaha outboards which gives it heaps of power. Effortless and comfortable 20 knot cruise, 40 knot sprint. Built as rescue vessel for New Zealand Sea Rescue. Was in NZ Survey until 2017. 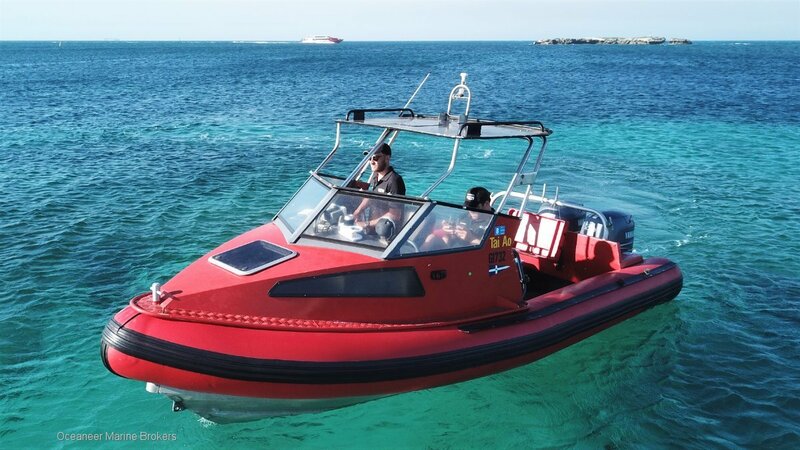 Great for fishing, diving, towing, day trip to Rotto. Holds 230L of fuel! 4 stroke Yamaha reliability. Vessel and engines always well maintained. Well suited to Yacht Club rescue vessel, harbour services, mooring maintenance, dive boat etc. Built to NZ survey standards, 6 Crew Inshore. Vessel able to be put in AMSA Survey. 2 x 2007 Yamaha 100HP 4-Stroke outboards with 1350 hours. Serviced every 100 hours to NZ survey requirements. Trailer re-galvanized in 2010. Survey certs from NZ on file. Ex-Harbourmaster vessel for Whangarei Shire.